Rhubarb Decimated…Preserves and Pie Galore! Last weekend, Matt and I dropped in to visit some very special friends. You know the kind of friends most people dream of having…sharing, thoughtful, giving of their time, energy, and love, different enough to be interesting but similar in all of the important ways. Jon and Suzann are the best of the best ~ “salt of the earth” and we are thankful to have them in our lives. Okay, enough of the mushy stuff, you get the point, we love these people. Suzann and Jon, grow an incredible garden of perennials, veggies, and annuals. They have a picturesque old farm-house surrounded by fields and forest and an unbelievably breath-taking garden that showcases Suzann’s artistic talent as a gardener as well as being the home of Jon Partridge Pottery and The Artful Garden. Together they make a formidable team and create an environment easily described as heaven on earth. Suzann also graciously gifts us enough veggies to keep a small army fed and we thankfully accept these gifts to put up each season. She has rhubarb growing in HUGE massive bushes. How else would Suzann do it!?! She’s not only got green thumbs but fingers and toes as well. 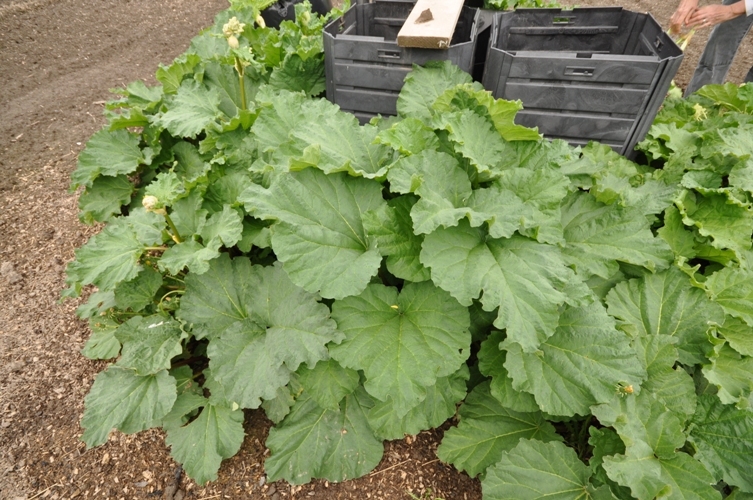 Her rhubarb plants were the largest I’d ever seen and totaled about 30 square feet. And, she kindly balded the patch and gave us the spoils. Now, what to do with 25lbs of rhubarb stocks. First, you reminisce about when you were a child, eating the bitter-sweet stocks (dipped in sugar), cutting and preparing them with mom for a pie, or maybe freezing some for a sample of summer in the dead of winter. Once the memories have stopped flooding back you’ve got to get to work. Washing, chopping, and sugaring up for some good olde fashioned preserves…rhubarb in light syrup. Wash rhubarb well, remove leaves, and cut into 1″ pieces. Toss with sugar, cover, and let stand in a non-reactive bowl for 4 hours. Prepare for water bath canning ~ sterlize jars in the oven at 250C for 30 minutes. Transfer mixture into a large stainless steel pot. Bring to a boil over medium heat and boil for approximately 30 seconds. Remove from heat and ladle hot rhubarb and liquid into hot jars, leaving 1/2″ headspace. Note: if necessary top each jar up with boiling water. Remove air bubbles, wipe rim with a damp paper towel, center lid on jar and adjusting ring until it is finger-tip tight. Process both 500mL (pint) and 1L (quart) jars for 15 minutes. Remove canner lid, wait 5 minutes, then remove jars. Let cool, label, and store. 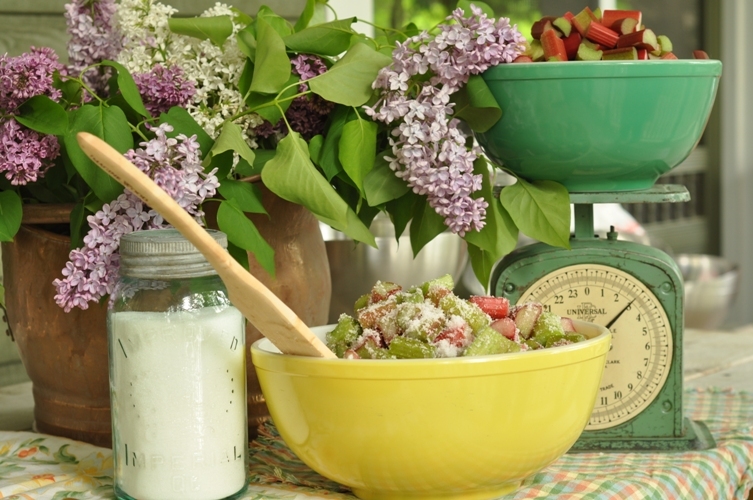 A recipe for the most delicious rhubarb pie to follow…so check back! I am without question making this over the weekend! 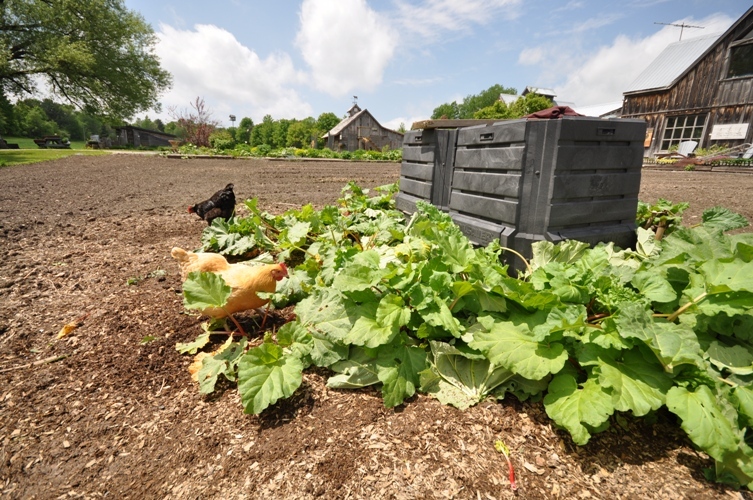 Every year I wait patiently for the rhubarb to come up and then decimate my own AND all family members crops! Everything is rhubarb for at least a month, longer if I can swing it! Awesome!…what else do you make with it? For something different, I wanted to try a rhubarb chutney and might do it with some of the rhubarb we froze. I tried a rhubarb upside down cake this year for the first time which was delicious. My usual items are a compote, chutney (plain rhubarb and with other fruits), muffins, breakfast bread (delicious with a light creamy cheese), and sometimes jam. 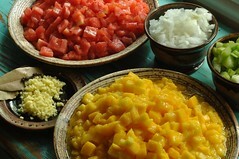 I recently had some rhubarb salsa which was beyond amazing! Currently trying to make that. Did preserving it in this method keep its colour, or was it on the green/brown side? I find the bigger stalks tend to cook up green-y. 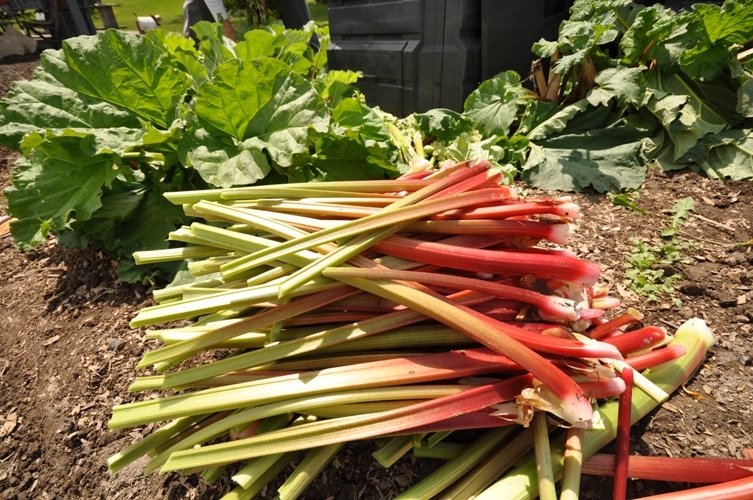 I’m about to pick up 30 lbs of free rhubarb (YAY!!) and I’ve already got a whack of plans for it, but I like this style as well. Yeah, it did go kind of green/brown but we’ve already had some on ice-cream and the colour sure doesn’t affect the taste. Same with the strawberries…they don’t look as nice preserved whole but don’t let looks deceive…they too taste awesome! Got to love free rhubarb! OK, so it was deeelicious. I made two batches – one regular and one with a vanilla bean scrapped and cut up and I’m enjoying it now with some plain yogurt. Absolutely delicious and an incredibly fast and easy was to use up extra rhubarb. Thanks again. P.S. I just received an order from the Vanilla Food Company out of Markham – have you checked out their vanilla beans? I’ll let you know what I think of them, as I got three different types of vanilla.